This will be the third and last part of our series that will help you to get up and running to do F# development with .NET Core on Linux. We’ve made this far and all we’re missing are just the finishing touches. As promised we’ll be looking at how we can link our build, run and debug workflow into vscode. The editor expects the project’s configuration to be located on a folder called .vscode at the project’s root folder, containing to 2 files called launch.json and tasks.json . We’ll be looking at how we can create and update them both manually and automatically. Let’s start with an easy one, the build task. Anywhere in the editor just run the default build command ( ctrl+shift+b ) and vscode will let you know that it couldn’t find a build task for the project and it’ll offer you to create one. That’s going to create a tasks.json file inside your .vscode folder (which it’ll get created automatically if it didn’t existed). If the .NET Core option doesn’t show up for you, don’t worry, manually create the tasks.json file and paste the following. Now we’re ready to build our project! Run the build command again ( ctrl+shift+b ) and this time you’ll see the following output. Now that we’ve set up our build task, adding one for running our project is trivial. Jump again into the tasks.json file and just add another task to the “tasks” array that looks like the following. This will be the last thing we add and it is as easy as the other two with a small caveat. Remember how I mentioned there were going to be two configuration files ? We’ll make use of the other one now. It order to debug, we will not be creating a task but a launch configuration. Automatically creating the configuration file is as simple as pressing F5 and selecting .NET Core as our environment. By default this will create the launch.json file with three default configurations, of which we’ll be only focusing on one for this article. Don’t worry, we’ll sort it out in seconds. Once you open up your launch.json, you’ll realize that while vscode created the configuration it hasn’t really specified which program it should debug and instead the path for the program contains two placeholders but because we’ve already built our project we can see what values it is expecting, so go ahead and replace <target-framework> with netcoreapp1.1 and <project-name.dll> with fsharp_tutorial.dll . And we’re done! 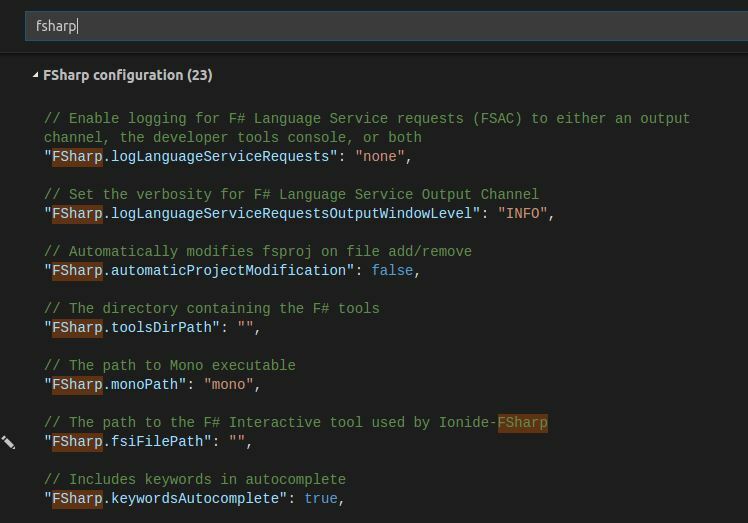 We’ve covered the basic setup to get your F# on linux journey started. This will be the second part of a series of 3 articles that will help you to get up and running to do F# development with .NET Core on Linux. Ok, for this particular entry we’ll be talking about tools that’ll improve our development experience. Unfortunately, one of the downsides of not developing on Windows is not having access to the excellent Visual Studio IDE but fear not, we’ll be covering a setup that should make us feel at home. Today’s post will focus on Visual Studio Code (vscode), a fantastic open source code editor developed by Microsoft. Sometime in the future we’ll be covering alternative tools, such as the promising Jetbrains Rider IDE and VIM/Emacs. Now head onto vscode’s download page and install the package corresponding to your favorite distro (both deb and rpm as well as 32 and 64 bits packages are provided). If you’ve been following our previous entry, you should have a folder fsharp_tutorial , go ahead and open it. The vscode extensions ecosystem is huge and worth spending some time looking at what it has to offer. For the scope of this series, we’ll only be covering one: ionide-fsharp . This extension comes to us thanks to the people at ionide and on top of the one that we’ll be looking at, they provide two more excellent F# extensions that you should check out. While the out of the box settings should be enough to get you started if you wanted to change something you can find the extension settings under ‘FSharp configuration’ or by searching ‘fsharp’ in the settings page. We’ll go over a few things now, so open up our Program.fs file. First thing we want to do is to add our add function that we used to test F# interactive on our previous post. Assuming things are working as intended, the first thing you should notice is the automatic function type signature displaying on top of our function. The second thing now will be to test the integration with F# interactive. We can do this in several different way but for this post we’ll use the default ‘send line to fsi’ shortcut which is alt+/ . Now your function is part of the interactive tool context and can be run. You can find the rest of the options by opening up quick search ( ctrl+shift+p ) and searching for fsi . On the next and final entry for the series, we’ll finish setting vscode for building, running and debugging our program. This will be the first part of a series of 3 articles that will help you to get up and running to do F# development with .NET Core on Linux. The first thing we want to do is to install .NET core. Microsoft provides us with very easy to follow instructions for your favorite distro here. Once the installation is over you can quickly check that it went well by running the following command. At this stage we will be able to create, run and build projects but we still don’t have access to the language itself. For that we will follow the instructions from the F# Foundation located here. One of the biggest benefits of doing so is to have access to the F# interactive tool, which we’ll use now to verify the installation went well by running the following command. Let’s use it write a very simple function to see it in action. The first time you fire up dotnet it will take a few seconds while it bootstraps and prepares its cache. We’ll create a new console app project which will be the basis for the series. This will assume you’re running this command inside a folder called fsharp_tutorial and that will be the name of our project as we won’t be specifying one. You should now have 2 new files called fsharp_tutorial.fsproj and Program.fs . Like with any other .NET core project type, we’ll need to restore its packages before can try to do anything useful. Now we’re ready for the moment of truth as we’ll run our program for the first time. If you see the above it means that your installation went as intended and we’re ready for our next step in this series which will be setting up our development environment.